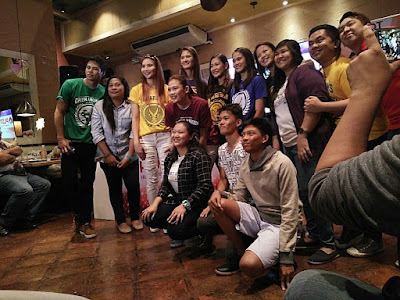 "UAAP Women’s Volleyball Season 79 stars join the PLDT Home Family"
In the photos, no particular order: John Vic De Guzman, Dindin Santiago, Rachel Daquis, Angge Tabaquero, Isa Molde of UP, EJ Laure of UST, Jho Maraguinot of ADMU, Benggadora, IC Mendoza with some lucky fans and media personalities. Missing in action are Kim Fajardo of DLSU, Bernadeth Pons of FEU, Seth Marione Rodriguez of UE, Jorelle Singh of NU, and Jessica Galanza of ADU. MANILA, Philippines, February 13, 2017 – The country’s most highly anticipated collegiate sports tournament, the UAAP, is once again set to bring a smashing season and take volleyball fans on another thrilling ride. The country’s leading telco provider, PLDT Home, presents UAAP Women’s Volleyball Season 79 with the tourney’s big stars joining its ever-growing family. New faces have been introduced to the media on Monday at Chili's Tomas Morato. 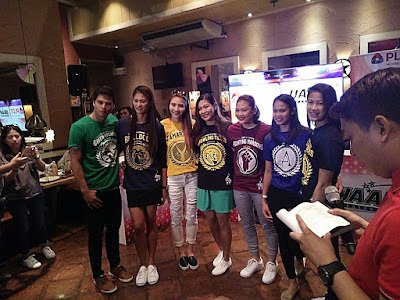 Joining top athletes and UAAP alumni Alyssa Valdez, Mika Reyes and Ara Galang are this season’s volleyball stalwarts representing different universities: Kim Fajardo of DLSU, Bernadeth Pons of FEU, Isa Molde of UP, Seth Marione Rodriguez of UE, EJ Laure of UST, Jorelle Singh of NU, Jessica Galanza of ADU and Jho Maraguinot of ADMU. Each member of the fun, powerhouse roster demonstrates the passion, dedication and vivacity that PLDT Home brand encourages among the young and active generation. A combination of talent, charm, charisma, and influence made it possible for these stars to standout from the rest of the pack. By supporting UAAP Women’s Volleyball Season 79 as well as last year’s run, PLDT Home continues its commitment in bringing the biggest events in the country. With the country’s most affordable home broadband Plan 699 which offers internet speeds of up to 3 Mbps, volleyball enthusiasts from all over the country can fully immerse in and maximize their enjoyment for the sport online, staying updated with milestone games, getting inspired by their favorite athletes and honing their own skills to become the country’s next superstar athletes. For access to real-time updates, behind-the-scenes and fun candid moments among the UAAP volleyball stars, visit chats.viber.com/volleyfriends and pldthome.com, like PLDT Home’s Facebook page and follow @pldthome on Twitter and Instagram.